It is a truth universally acknowledged, that anybody in possession of a blog must be in want of an opening sentence--and that if the blog post is going to be about Jane Austen and Pride and Prejudice, the opening sentence is going to be some version of the first line of that book, pummeled into shape to suit the text that follows. Yesterday, Monday, January 28, 2013, marked the 200th anniversary of the publication of Pride and Prejudice. 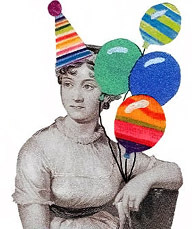 This event's being celebrated worldwide by Austen fans with readings, marathon movie viewings, parties, and more. Counting ourselves among her fans, we didn't want to be left out of the fun. You are the gorilla my dreams. We (or should I say "I," as I'm the bossy social-relations rep, chief Austen fan, and cook in the household) decided to celebrate by having a Regency-era dinner with old friends, one of whom was once in a Jane Austen book club with me and who also worked with me as a docent at Woodland Park Zoo (a nice commingling of Austen and Orangs). I finally decided on Chickens with Tongues. Yes, chickens have tongues. But no, this recipe didn't call for chicken tongues. 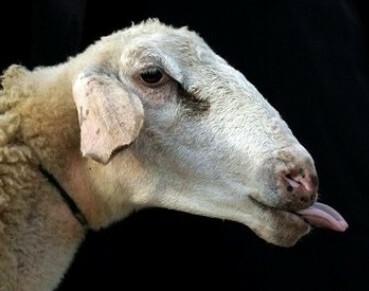 The tongues in question were sheep tongues. Which apparently weigh a quarter-pound each and take more than 2 hours to simmer to cooked perfection. Not that I was going to try this at home. I still remember when I was about six or so, and my German grandmother was living with us, and I used to sneak friends into our kitchen so I could show them the packaged, sliced "bologna with tongue" that she kept in the meat tray of the fridge. I'd hold it up because there, embedded in the slices, were slivers of tongue, like specimens in a glass slide. Ewwww! I should've done this at Halloween and charged admission. Even the author suggested that "boiling sausages will provide a suitable flavour contrast to the chicken in an acceptable shape." That wasn't the only substitution I made: The boiled "poussins" (month-old chickens weighing a pound or less) were replaced by roasted chicken breasts (being from modern behemoth chickens, each of these probably outweighed a poussin). The boiled cauliflower, at the author's suggestion, was replaced with rice. I swapped the boiled spinach for broccoli, and left out the rashers. But we did pile it all one on plate, with the rice in the middle and the chicken, sausages, and broccoli fanned out around it, because the author noted that "This dish illustrates beautifully the Regency delight in symmetry and display, shown in precise shapes and colours--even on the dinner-table. An interesting dish for a small, formal supper." The result was like a birthday cake you make following the instructions in a book only to have your cake come out looking like a candidate for the website "Cake Wrecks." Oh well. Like the cake, it was still tasty. We served it with more broccoli, as well as bashed neeps (mashed rutabaga) and a green salad. Dessert was a trifle from a recipe in Irish Traditional Cooking by Darina Allen. We did not read aloud from Pride and Prejudice, but fortunately this did not cause people to throw fruit snacks or trifle or any other foods. 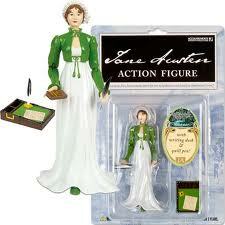 I wondered what Jane herself would have made of the hubbub surrounding her book's anniversary. I bet she would've liked it--she seemed to have a great sense of humor, a taste for the absurd, and a great talent for making wry comments. 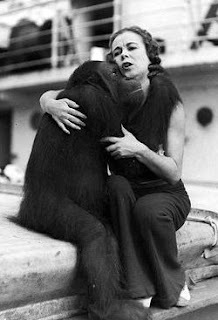 The book wasn't overlooked in its time, either, and it enjoyed some favorable reviews (presumably written by primates with less fur than Albert). One reviewer called the book a "very agreeable novel" that "rises very superior to any novel we have lately met with in the delineation of domestic scenes." "Upon the whole...I am well satisfied enough. The work is rather too light, and bright, and sparkling; it wants shade; it wants to be stretched out here and there with a long chapter of sense, if it could be had; if not, of solemn specious nonsense, about something unconnected with the story: an essay on writing, a critique on Walter Scott, or the history of Buonaparté, or anything that would form a contrast and bring the reader with increased delight to the playfulness and general epigrammatism of the general style." I bet very few of those guys got to have an Archie McPhee action figure made of them, complete with writing desk and quill pen! Tomorrow, January 25, is Robbie Burns Day--the birthday of Scottish poet Robert Burns (who, according to Wikipedia, is also known as Rabbie Burns, Scotland's favorite son, the Ploughman Poet, Robden of Solway Firth, the Bard of Ayrshire, and, in Scotland, as The Bard). I will leave it to you, dear reader, to delve into original source material (or Wikipedia, as you wish) to find out more about the man who penned "Auld Lang Syne," "To a Red, Red Rose," and more. Despite having been an English major, I have had very little contact with Robert Burns and his work. Which means I also did not know much about Robbie Burns Day and the wonderful institution of having a Burns supper, replete with ritual, special dishes, speechifying, and levity to spare. Rats. 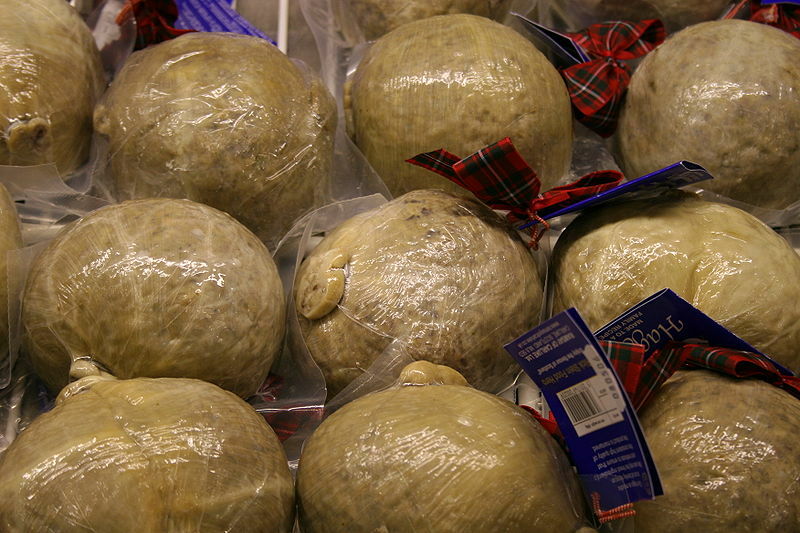 Not that I ever, ever want to try haggis, that saggy sack of sheep's insides mixed with oatmeal, spices, and onions, though I'm insanely jealous that the Scots have a food that is brought to the table accompanied by the skirl of bagpipes and that is then celebrated in verse ("Address to a Haggis," by guess who). I can safely say I've never called anything put before me the "great chieftain o' the puddin-race." A few years ago, I was in downtown Seattle with a friend of mine who enjoys treasure-hunting at the Goodwill Outlet. Yes, Goodwill, that outlet of outlets, actually has an outlet of its own. It is the last step for objects before they are recycled, thrown away, or, in the case of clothing, shredded to make rags or baled up for shipment to Africa and other overseas markets. At the outlet, most of what you buy is priced by the pound. You shove it into a sack and they weigh it at checkout. Other items, such as books and appliances, have a different (though still very low) pricing setup. A glance at the contents of the battleship-sized wheeled blue bins reveals why most of this stuff never sold in the Goodwill store itself (it's ugly! ), but it's amazing and somewhat disheartening to see just how much good stuff is mixed in with the jetsam. My friend L. has found vintage, high-quality clothing and even antiques, such as a century-old handmade quilt and a darning egg. My daughter found a brand-new Breyer stuffed horse, clean with the tags still on. I found a brand-new L.L. Bean down coat for a friend's young son. I met one woman who scours the bins for brand-new or barely used baby clothing, which she takes home, washes, and then donates to organizations that will make sure they actually end up on babies and not in the shredder or baler. The outlet has its own rules and culture. One of the cardinal rules is that, when a new bin is rolled out, nobody touches a thing in it until a Goodwill employee gives the signal. The "regulars" at the outlet immediately surround a bin when it's put into place, positioning themselves around it like diners at a feast--though in this case it's more like contestants at a hotdog-eating contest. It's rather fearsome. Most casual visitors, like me, stand back and cede this turf to the regulars, who seem to be made up of people who are truly down on their luck as well as people who dive for treasure to sell on eBay or in vintage shops. On one of my rare visits, I was present when a new bin of books rolled out. 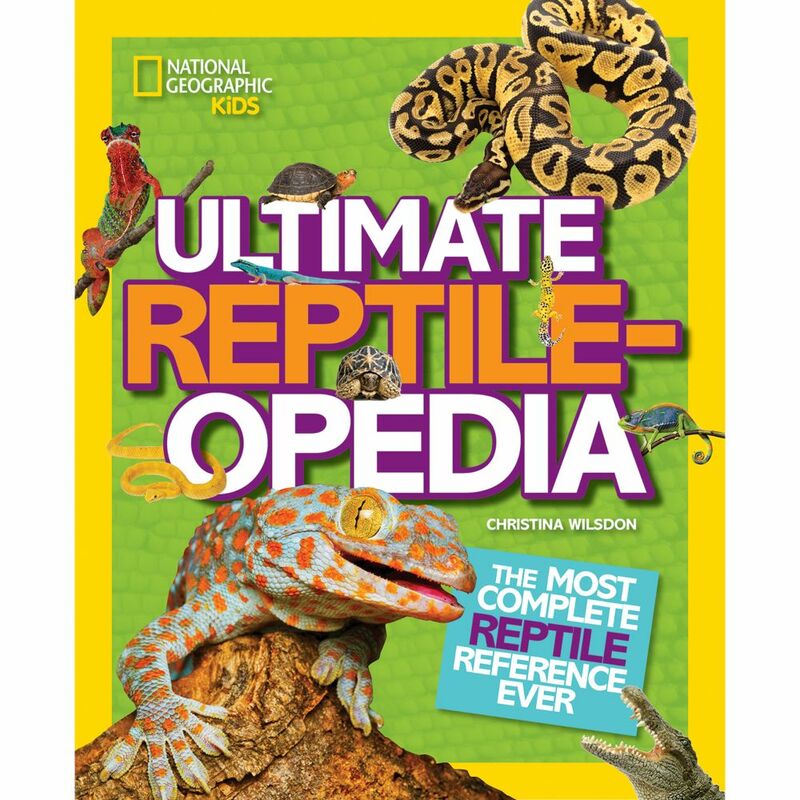 The book bins are usually pits of remainders, tattered romance and mystery novels, old magazines, ancient Reader's Digest condensed books, outdated textbooks, and the like, but sometimes there can be decent copies of novels, children's books, and the odd, interesting vintage volume. So when I saw hordes of people descend on the new bin and take their stations, I naively thought they were avid readers or book collectors eager to see what possible literary gems might lie in this ultimate slush pile. Which shows you what an idiot I am. When the signal to dive in was given, the chaos that ensued was like a nature documentary about vultures ripping into a dead elephant. People grabbed books willy-nilly and flung them by the armload into shopping carts and rolling canvas bins. Woe betide the person standing in the wrong place if volume M of an encyclopedia came flying through the air. As the bin emptied, the book-flingers trundled their carts off to the outlets' sides, where they quickly sorted through their haul. Some had hand-held devices for scanning bar codes on the books. I don't have a clue as to what, exactly, people sought in their purchases, but after a quick sorting they began bringing the rejects back to the bin and unceremoniously chucking them back in. At this point, the book barge was now attended by only a few pickers, and I tentatively joined them. That's when--whump!--a big brown book was tossed back onto the heap. A big brown book with gold embossed on the cover, deckled edges, and no bar code. It turned out to be an edition of Robert Burns's poetry published in the late 1800s. It showed its years; the binding was ragged, a mouse had nibbled the corners, ink stains marred its edges. But it was beautiful, just a beautiful object. Holding it, you got a sense of how, before mass production make cheap clothing and books possible, a book might be something you'd cherish and pass along through generations, even if you didn't particularly love the poems inside it. I couldn't believe such a book didn't make the pickers' cut, though later I understood why; eBay alone had several of these old books, and they weren't budging at only eight bucks. But still, this book needed rescuing, so for 50 cents I took it home. Over the next few weeks, I picked it up from time to time to admire the details and care that had gone into producing it. It was filled with elegantly wrought engravings of lonely lasses, mournful dogs, heaths and moors. When I ran my hand over the fine-quality paper of pages, I could feel the impression of the type on the other side of each page. Even the penmanship of the book's owner was a little work of art. This book would prove to be one with a most happy ending. One day, during my monthly craft-group gathering, conversation turned to the Robbie Burns night celebration enjoyed by one of my friends, who is married to a Scotsman. She told us about the speeches, the haggis, and the existence of a rather tasty vegetarian version of haggis (who knew?). It was quite clear where this edition of Burns's work belonged--and so it was passed along (without any flinging, Highland or otherwise) and now resides in a place of honor on a desk, where it's regularly perused by my friend's children. So, Happy Birthday, Robert Burns. “Should auld acquaintance be forgot and never brought to mind?" Not this edition of your work, at least. 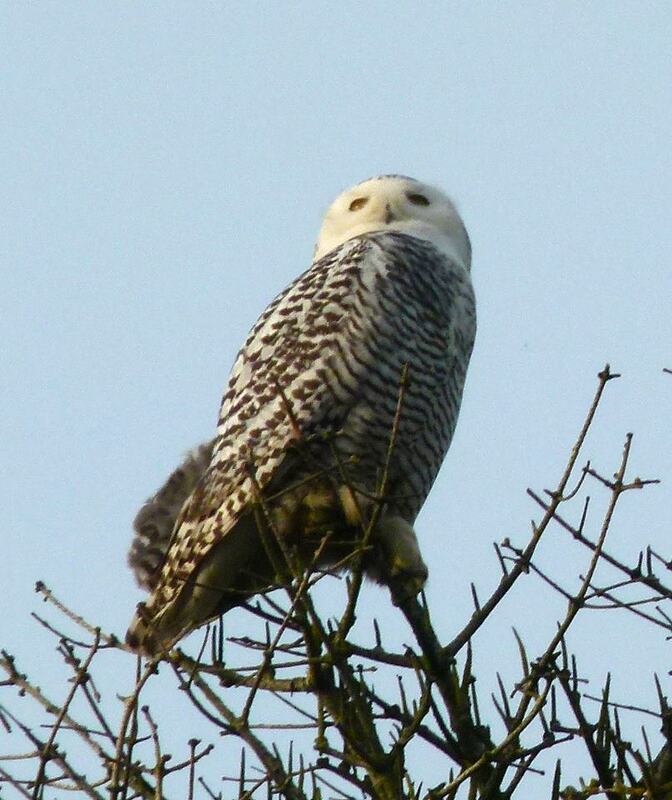 Snowy owls silently swept south into Seattle again this winter. On whispering white wings, the owls beat their way from the Arctic tundra in search of food, their flight muffled by feathery fringes that dampen sound. Here they perch on roofs and in trees, at airports and on beaches, keeping their counsel. One of these owls has taken up residence in Ballard near Sunset Hill Park, a small patch of green with a sweeping view of Puget Sound and the Olympics. She perches in a tall Douglas-fir on some days, atop chimneys or roof slopes on others. From this commanding position, she employs the "sit and wait" hunting technique of her kind, surveying her realm for the slightest movement of possible prey. 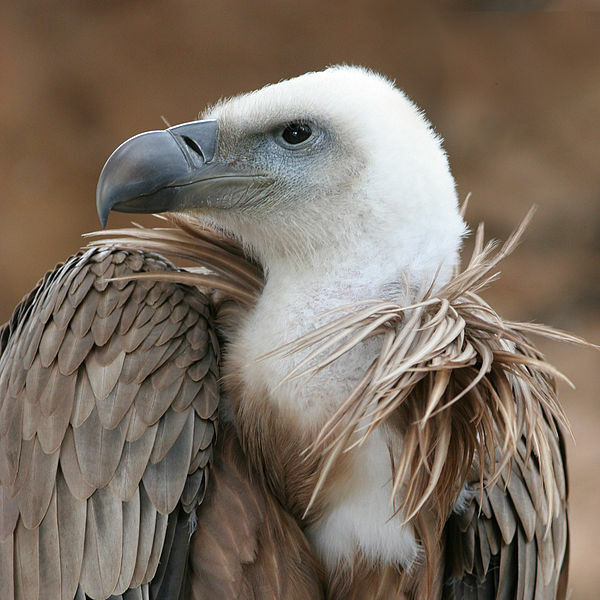 "She" has been identified as most likely being a young female due to the extensive dark-brown markings in her plumage. Young snowies are more heavily barred and spotted than older owls in general, but immature males tend to have paler markings than females and more of a white bib; females' brown markings can also be so dark as to appear black. According to the Cornell Lab of Ornithology, "any Snowy that looks nearly black and white is probably a female." Last year, I never got to see the owls who landed in Seattle as part of a nationwide irruption of snowies (an irruption that resulted in a snowy owl showing up in Hawaii for the first time ever). I wasn't going to miss my chance this year, so I made sure to pop over to Sunset Hill Park several times. I finally got lucky on one of those visits after learning that the thing to do was not to visit the park and look for an owl, but rather to drive up the street and look for the gaggle of people with telescopes and camera lenses aimed at the owl and join them. That's when I saw her in all her chiaroscuro splendor, sitting calmly in an evergreen, dozing. Her closed eyes curved like crescent moons, making her look as if she were enjoying a quiet laugh. 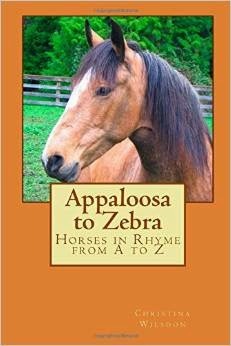 Occasionally she stirred and her eyes winked open, revealing the yellow full-moons behind her lids as she swiftly swiveled her head. 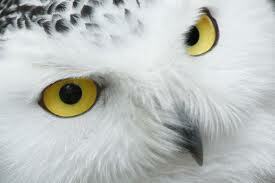 Irruptions of snowy owls typically occur every few years in response to cyclical fluctuations of lemming populations in the Arctic. If snowy owls had school cafeterias, lemmings would be their tater tots. These rodents form the bulk of their diet, and it's estimated that a typical snowy eats about 1,600 of them a year. In lean years, when lemming populations are down (a result of lemmings gobbling up all the vegetation in boom years and then having to pay the piper, ecologically speaking), immature snowy owls are crowded off the hunting grounds by older, dominant owls who claim the available territory. Hence the younger owls' nomadic forays into other climes. Snowies aren't limited to lemmings, so they're not fussed about eating other foods in lemming-less lands. On the tundra, they also catch arctic hares, mice, ptarmigan, waterfowl, and even fish. (Indeed, its Swedish name is Harfang, which means "the owl that catches hares.") Elsewhere, they can subsist on a diet of ducks, gulls, rabbits, crows, rats, moles, and squirrels. They're not above scavenging roadkill, either. Despite their size (about 2 feet long, with a 5-foot wingspan and a weight of up to 6 pounds), snowy owls move quickly--and the crows that sometimes mob Seattle's visitors are advised to keep their distance even from an owl that appears to be fast asleep. The 1936 tome Birds of America notes in its entry on the snowy owl that if a crow comes too close, "the ghost suddenly launches out on strong, silent wings, the great talons strike and close, and there is a Crow who would have been the wiser but for the circumstance that he is very dead." The appearance of these ghostly birds far south of their usual winter range is nothing new. Native American peoples were familiar with the arrival of snowies and had their own speculations about why the white owls appeared. 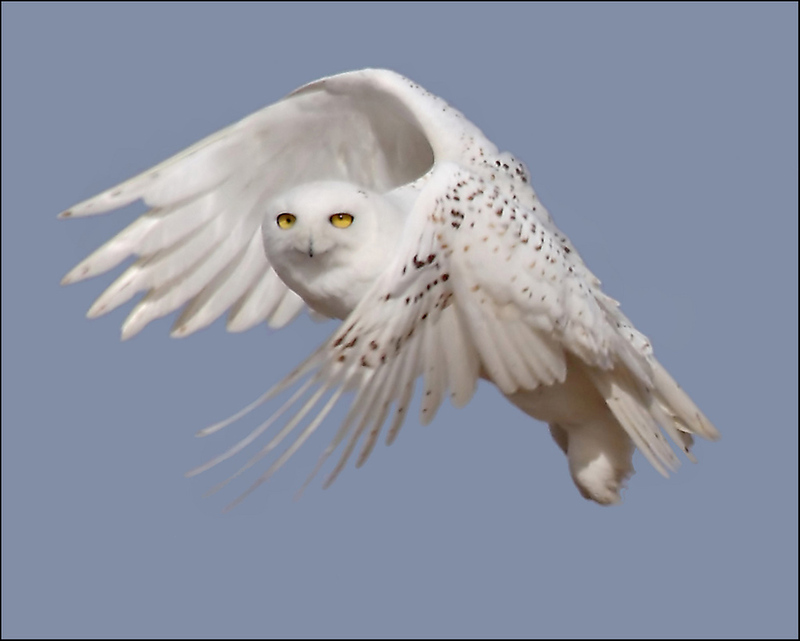 According to a January 1965 article in The Milwaukee Journal about the deadly Blizzard of 1886, survivors of that storm recalled the "omen of the snowy owls. All through a warm autumn they came, ghosting through fog to roost in tall cottonwoods along the river. Indians warned settlers to expect bad weather, but few paid attention." John James Audubon, writing more than a century before Alaska became part of the United States, knew about snowy owl irruption, too. He pointed out that "This beautiful bird is merely a winter visitor of the United States, where it is seldom seen before the month of November, and whence it retires as early as the beginning of February." He himself saw snowies in Kentucky and Ohio and notes that others popped up in Pennsylvania and New Jersey. An 1887 "Cyclopedia of Natural History" recounts the circumpolar species' irruptions overseas. Snowy owls there are known for "occasionally straggling in winter to the British Islands, various parts of Central Europe, South Siberia, Mongolia." The book's author was aware of North American irruptions, too, commenting that "Sometimes there is a large flight of them along the seacoast, so much of a one indeed that the fact is duly heralded in the local newspapers." In this respect, neither the owls' behavior nor that of newspapers has changed one whit. Fortunately (despite the shooting of the wayward bird that landed in Hawaii), the snowy owls' reception has changed, thanks to laws that protect our native birds. Writing in the 1920s, naturalist William Dawson lamented that during an irruption "No opportunity is ever lost of killing one of these handsome midwinter visitors; and one might suppose, from the number of specimens which adorn store windows and taxidermists' shops, that the bird is much more common than it really is." 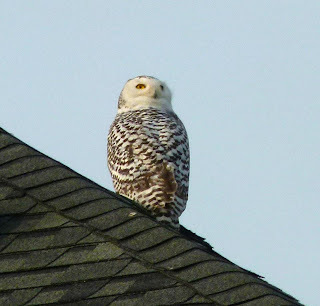 Sighting a snowy owl is not the only reward for visiting the Sunset Hill Park on a crunchy, cold, clear-sky winter day. The day I stopped by, I also saw an Anna's hummingbird buzzing in a bare treetop farther down the slope. Few places, I imagine, offer a chance to see one of the world's smallest birds--a subtropical species that's expanded its winter range northward thanks to an abundance of feeders and nectar-rich exotic garden plants--with one of the world's largest owls, who's migrated southward from a land of ice and snow and not quite enough lemmings. The hummingbirds are already starting their courtship and will soon be nesting. Some will be feeding nestlings by the end of February, by which time the snowies will have headed back to the tundra to start their own families. Temperatures have dipped below freezing for the past few days. The car locks are frozen solid in the morning. Every leaf and grass blade is fringed with white. The Anna's hummingbird who rules the side garden perches in the bare plum tree, waiting for me to blow-dry the frozen sugar-water-filled feeder so he can have his breakfast. These are fine days to stay inside and make good on a New Year's resolution to cook at least one new recipe each week. The kitchen shelves creak under the weight of yards of cookbooks and bins of recipes clipped from magazines even though, week in, week out, I tend to plonk down the same routine of pasta and sauce, meatloaf, macaroni and cheese, hastily tossed-together stir-fries, and roasted chicken with rice and broccoli. Not that it's a bad routine, but those cookbooks are looking sort of resentful and making me feel kind of guilty. So: the first week of 2013's new recipe was...roasted chicken. But not just the usual "throw in oven, turn up heat, cook til done" roasted chicken I usually make. I took the time to brine two chickens and roast them according to the instructions in the America's Test Kitchen Family Cookbook. The friends we'd invited for dinner brought the side dishes (spinach salad, couscous with cranberries). Having guests--a rather rare event, sad to say--inspired the try-out of a second new recipe: a dessert of Apple Bundt Cake, taken from the pages of Bundt Cake Bliss by Susanna Short. Served with powdered sugar and a dollop of fresh whipped cream on top, it tasted what like living inside an apple tart might be like. Which I mean to sound like a good thing. This week's freezing weather has been offset by roasting pork loin, again using the brine-and-roast method from the Family Cookbook, which yields a succulent roast that cozies up nicely with red cabbage, egg noodles, and peas. Sadly, there's no bundt cake to round out this meal. After all, there's that other pesky New Year's resolution--the one having to do with getting in shape--to uphold. Much better birders than I were probably up before dawn on New Year's Day, tallying birds for the Audubon Christmas Bird Count. Seven a.m. on the first day of 2013 found me savoring the first cup of coffee of the year, loitering before opening the curtains for fear that the first bird I'd see this year would be one of the house (English) sparrows that have been mobbing the feeders this winter, doing their best (and failing) to keep other birds away. My concern about the first bird I'd see is due to the "first bird of the year" game enjoyed by many birders (and non-birders). It's based on the idea that the first bird you see on January 1 is the species that becomes your theme for the upcoming year. But I didn't really cherish the notion of this pugnacious, unloved bird of the monotonous song being my first bird of 2013. So, being a clever sort of person after a hit or two of coffee, I decided not to open the dining-room curtains first, as that window overlooks the feeders, and instead open the kitchen curtains first, as that window looks into the feeder-less backyard. Brilliant, n'est-ce pas? Robins are famous harbingers of spring, but these revelers weren't heralding an early end to winter. 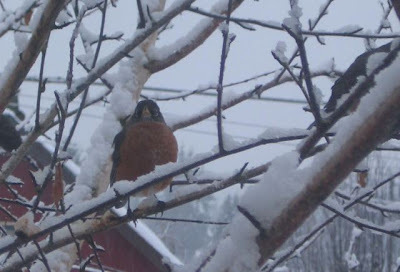 The American robin is what's known as a "facultative migrant"--they typically migrate only short distances and usually only as far as they need to go to find food or avoid really bad weather. In some places, such as the Puget Sound region, robins stay put year-round. Winter is generally kind here, and there's an abundance of fruit and berries to sustain them until spring brings a banquet of worms and insects. Seattle Audubon's "Birdweb" site notes, however, that "most often the birds that breed in Washington migrate south and are replaced for the winter by birds that nest farther north." So I don't know if these birds are the same ones who'll be caroling in the neighborhood in April. 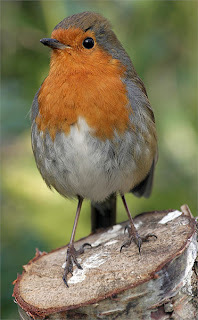 So what might a robin augur for the next year? 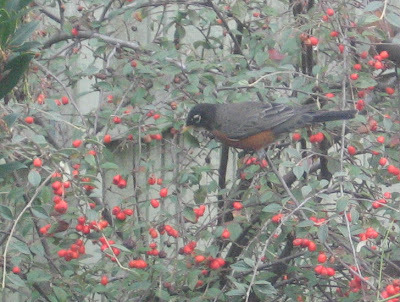 If I'd seen a European robin, there'd probably be a cornucopia of superstition to draw from (and a load of birders tramping into my yard to view this wayward bird). The European robin (at right, below) is a completely different species, which American colonists had in mind when they named the red-breasted bird they encountered on this side of the pond. Europe's "Robin Redbreast" carries a heavy load of myth, legend, and lore on its 20-gram back. A lot of this has been innocently transferred to the American robin by people unaware that the two "robins" aren't related. 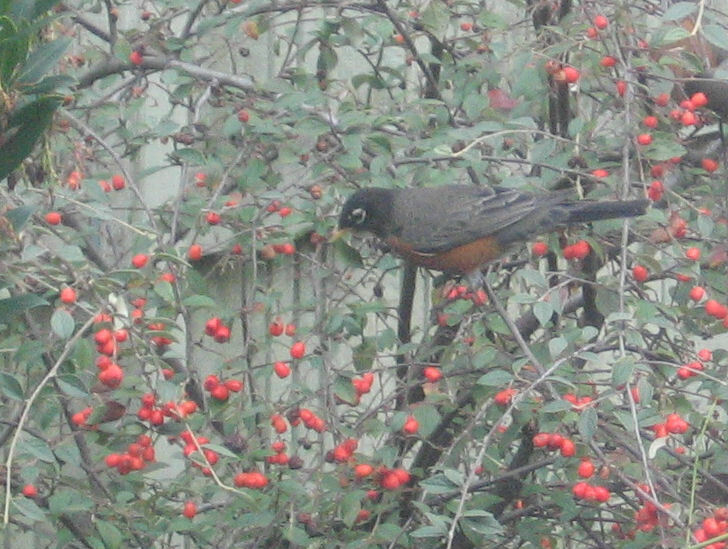 This made me wonder if American robins figure in Native American folklore. A quick Google search reveals that they certainly do, and that the topic is much better served by digging into books; what's available online barely even hints at the role the robin plays and what it signifies, and it's all mixed up with a new-age dreaminess. However, the scrim of information online is enough to suggest that robins in Indian lore were portents of spring, with songs created to delight humans. 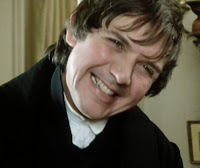 Well, it'll be another year before I post anything about the robin if I wait until I can get those books via interlibrary loan, so for now I'll gladly settle for anticipating a year of good fortune and joy. Any bird whose song is often rendered in field guides as cheer up, cheer up, cheerily has got to be a symbol of good things to come.